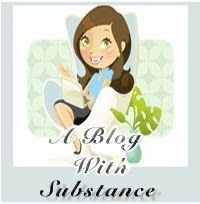 The lovely, kind and generous Garry @himupnorth has awarded me the Blog of Substance Award. Now he did create a new rugged, manly badge for the this meme however being as I am a girl, I am sticking with the girly one as above! Ladies, I pass the Blog of Substance award on to you, well deserved in every case. I Love The Twitter #Spooks! Not only is your blog one of substance but also of colour! Great response & isn’t it nice to get an award? Enjoy! Lol thank you, I made it pink to emphasize it’s ‘girlieness’ and then got carried away! Thank you for accepting the award, Lisa! A new look blog of substance, no less. I’m motivated to shift my arse and move mine. Sorry for tagging Metajugglamum afore ye, but she too is worthy. She hasn’t accepted, to my knowledge, so maybe your mention will spur her on? Love the five-word philosophy. Nice one. Dear Lise, Many congratulations on your award! Your blog look fab and you look such a beautiful lady. Thank you very much for your Secret Post Club presents. I’ve just received from the postman and I’m so excited. Many thanks for the books, they look wonderful. I’m a disaster in the kitchen but I love to try new recipes and The Seasonal Cookbook is full with delicious and healthy recipes I will love to try! And what a great thought to send me a cookery book for my daughter as well! She loves cooking and baking so much that just yesterday I enrolled her in a Masterchef Cookery Skills course in August. She will be as thrilled as me when she gets home from school. Wish you and your family a wonderful summer. Many thanks again for your lovely present. Ciao. A. Well done! Fantastic blogging philosophy too!